Back Be Nimble advocates flexibility for enhanced productivity. Our Danish workstations like the Generation IV from SIS-USA support this philosophy. That is, they allow for minor posture adjustments and the versatility necessary for a user's comfort and enhanced productivity. The user can have his monitor and keyboard on separate levels, allowing independent height adjustments for ideal viewing and typing comfort. 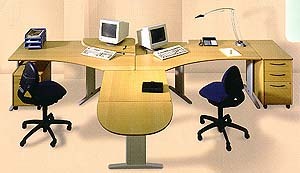 Generation IV computer support furniture is a modular system with full sitting and standing ergonomic adjustments. It enhances productivity and minimizes complaints of the back, neck, shoulder and arm. The line of bi-level tables with sliding, tilting keyboard work surfaces and independently adjustable VDT surfaces make Generation IV an ergonomist's dream. Level adjustments are made easily with top mounted cranks even when the work surface is loaded with a lot of weight. Our Generation IV and more economical Partner Products may be integrated with other manufacturer's workstations. Work surfaces crank height adjust (left and right handed) from 23" (keyboard) to 39" (VDT) to fit seated and standing workers. Save time with the wire management vertical pop out leg covers and deep horizontal troughs which securely hold wires, power strips, etc. Optional field installed accessories let you buy what you need now, and add later as your needs change. Laminate tops come in six different colors. You will need to specify your preferences for top laminates and frame finish when you place your order. Click here for instructions on how to build your own workstation.